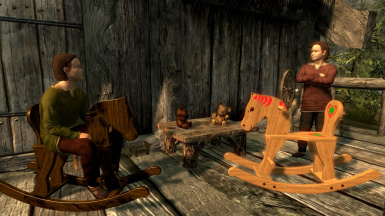 More toys for the children of Skyrim! You may use the meshes and textures for your own mods as long as you give credit to the author including the creator of the original model and you do not charge money for it. This is a modder's resource. You may use the meshes and textures for your own mods as long as you give credit to the author including the creator of the original model and you do not charge money for it. For those who are not familiar with the Creation Kit I offer an optional download with a demo esp and additional meshes for take-away rockinghorses. 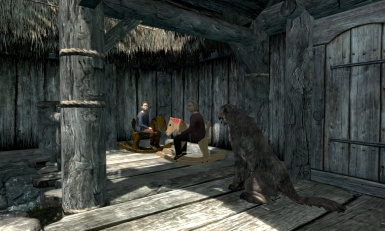 I added two furniture rockinghorses to the porch in front of the Sleeping Giant in Riverwood where they are often used by children and I added four clutter rockinghorses behind the inn that you can add to your inventory and place whereever you want. You can not sit on those of course, they are only for decoration purposes. 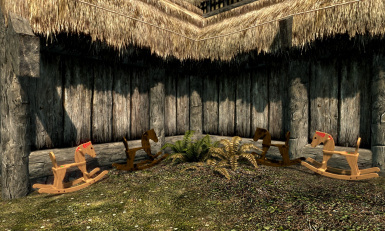 Version 1.3: Having more experience with Skyrim collision meanwhile I added better fitting collision to the all of the rockinghorses.